I wanted to do another cloud painting and, with thunderstorms promised, I hoped this afternoon would provide an opportunity. I drove around the countryside for a while but nothing much came of it. The clouds just weren't doing anything useful for me. We didn't even get the promised storm. I considered doing another plein air sketch there today but with a heavy veil of cloud building in the west, it was apparent that the light was going to fade fast. I did a couple of thumbnail sketches to test some design ideas and see if that would make any difference, but it wasn't going to happen. This digital painting was done completely from the memory of what I saw today and what ideas I'd tried in the thumbnails. I guess I looked carefully at the scene for about five minutes, all up. But I didn't even refer to the thumbnails for this painting, just my recollection of them and the three paintings I'd done before. There are some obvious differences from my earlier paintings, not least of which is the mountain ridge rising from left to right. This is a design decision and does not reflect reality. The biggest change, though, was to choose a vertical format and make the sky much more important. 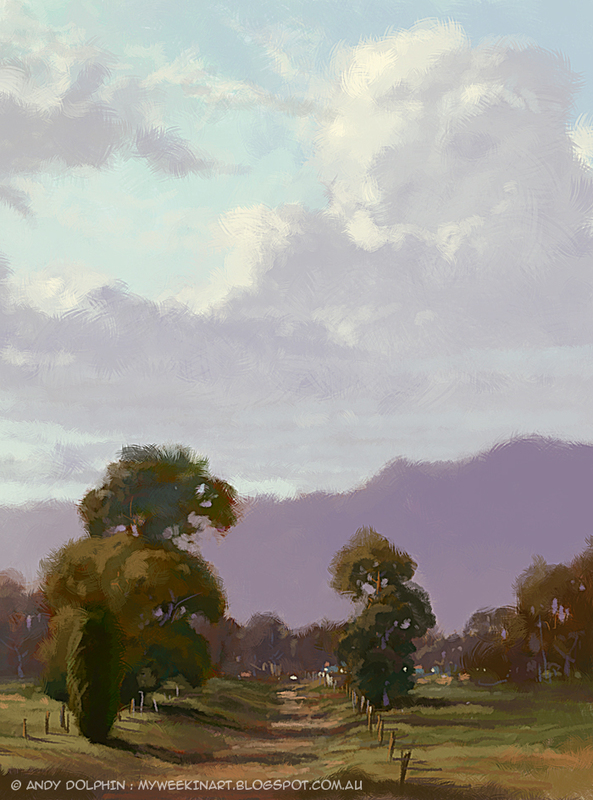 For the cloud shape, I drew on the memory of my previous plein air cloud painting. I think it's got possibilities for this, my "Year of the Cloud". Technical specs: Photoshop CS5, Wacom Graphire 4 tablet using stylus held together with sticky tape, digital brush from Chris Wahl. The problem is I generally begin digital paintings as doodles, with no intention of producing anything useful. I will look forward to it. I gave John a Wacom tablet for Christmas (no sticky tape needed, yet), and just curious to see how you work it, if that is possible to do. Are you thinking Michael to video it or use some screen capture software for the movie? It would be a screen capture. My basic approach is the same as my approach to oils. I throw in large areas of "dark" base colours then work over the top with mid-tones before adding highlights. I mostly use one brush style - but brushes are where it's all at with a tablet because so many things can be made pressure-sensitive (and even tilt-sensitive with a higher-end tablet).